shopnewbalance.com: New Balance 1011 - One of the Best Got Better! New Balance 1011 - One of the Best Got Better! 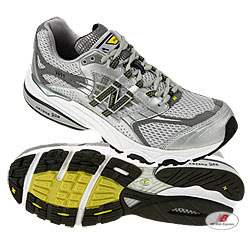 The New Balance 1011 running shoe is "one stable ride..." according to RunnersWorld.com. So what is so great about the 1011? You might be asking this especially if you are a loyal fan of the 1010. The added benefits and updates include an "updated flex groove that runs all the way across the width of the shoe." The better feel for the 1011 is also thanks to the new sock liner and extra cushioning, both huge positives when it comes to high mileage running. Some features have been carried over from the 1010 including the ROLLBAR® GR for incredible motion control. If you tend to over-pronate, the ROLLBAR® GR will give you that added stability to keep your feet from floating inward as you run. So if you are a past fan of the 1010, the 1011 might be the next best pick for you...it's great for a change but some good things are just built to last! I think with the 1011 you get the best of both worlds.